HEALTH CLINIC on July 31st One-Stop Spot for School State Health Requirements! Is your child ready for the upcoming school year? 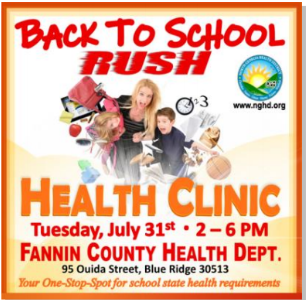 The Fannin County Health Department is conducting a Back To School Rush Health Clinic on Tuesday, July 31st from 2 p.m. to 6 p.m. at their location in Blue Ridge. The required Hearing, Dental, Vision and BMI/Nutrition Screenings will be available: Total cost for screenings is $50. Also, immunizations will be provided for school-age children for $21.90 each (for uninsured or underinsured). Medicaid, including Amerigroup, Caresource, Peachstate, Wellcare, and Peachcare for Kids are accepted. Blue Cross/Blue Shield, Ambetter, CIGNA, HUMANA, AETNA, Coventry and Meritain are also accepted. The health department is located at 95 Ouida Street in Blue Ridge, Georgia. For more information, call (706) 632-3023.